If you consider manga endings a gift, Kodansha’s Young Magazine has a big one coming this Christmas. 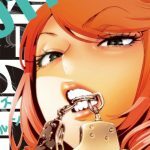 According to the latest issue, Akira Hiramoto’s Prison School manga is officially set to end in the next one, which hits stores in Japan on December 25. Prison School first launched in the pages of Young Magazine back in 2011, and it inspired a 12-episode anime adaptation in 2015. Yen Press publishes the manga in North America.